I have used LM products for years. This is a suggestion for anyone espec. Tarot readers. I cleaned my reading room down with Chinese Floor wash. Then I burned a Saint Barbara Candle, and asked her to help keep negative people/customer away, and good ones close. Don't ask why, but she worked wonders. Then I took an oil burner and burned Psychic oil. It gave the room such a positive energy and a psychic energy at that. Well, this is certainly a helpful tip for me too. Maybe I'll try it out too..thank you for sharing. Thanks for sharing that info Tarotcardfairy! I'm glad the products work for you! I love all of the products in the Psychic Vision line. Great stuff! Thank you St Barbara for all you have done for me. Thank you saint barbara! You are truly wonderful, and I couldn't have done it without you. What offerings does Saint Barbara like. What color candle should I burn for her? Hello! I know this post is a bit old but I figured in case someone else asked why not answer!! So I usually burn red candles for Saint Barbara!! I have burned white before but I haven't had much luck with those! As for offerings, I usually give her big red apples cut into sevens with honey poured on top, and one single red rose... I just recently found out from lucky mojo that you can give her red wine and cherries! She truly is a great Saint to have on your side! Great for keeping away enemies! Take care of her & boy oh boy will she take care of you!! 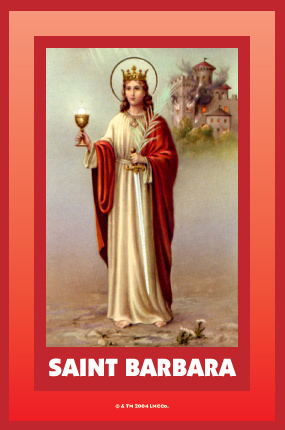 Thank you Saint Barbara for all you have done for me! Thank you St Barbara for helping me. I pray that you will continue to help me and break down all obstacles standing in our way. Thank you! Thank you St Barbara for helping clear away obstacles for my love this weekend. I pray you will continue to help me. Thank you so much St. Barbara for answering my prayer. I pray that you continue to help me. How are all of you doing ? or only after she come through on a petition? 2) what if i need her to banish really jealous enemies ? Do i still use red or black candles ? 3) when i ask for her to intervene is she swift ? Or do i have to ask for her help a few times over few days? Her colors are typically red and white.